Founded in 2001, following a joint venture between major shareholders Punjab National Bank and MetLife International Holdings LLC (MIHL), PNB Metlife Insurance as its presence in more than 7,000 locations spread across the country. 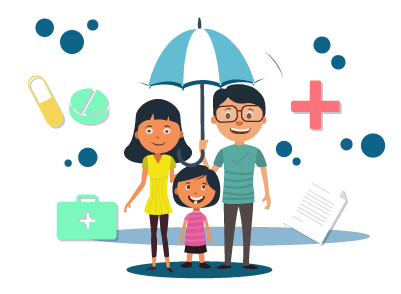 PNB Metlife Insurance offers a wide range of life insurance products that cater to individuals, families and groups. Existing PNB Metlife Insurance customers and new customers who wish to avail a PNB Metlife Insurance policy, can contact the customer care for queries, feedback, etc. They can get in touch either by calling the customer care toll-free number, by sending them an Email, Fax or SMS. Depending on the city the customer resides in, he/she can also get in touch with any of the branch locations of the insurer as listed below. Existing PNB Metlife Insurance customers residing in India can contact the customer care unit of PNB Metlife Insurance by dialing 1800-425-6969. Customers have to dial 91-80-26502244 for the PNB Metlife Insurance Interactive Voice Response. Customers can fax their service request to 91-22-41790203. For any service request, complaint, feedback, etc., PNB Metlife Insurance customers can write to the customer care unit at indiaservice@pnbmetlife.co.in. PNB Metlife customers that have problems, queries or wish to give a feedback can SMS the PNB Metlife Insurance customer care unit at 5607071 in the ‘MET HELP’ SMS format. Andhra Pradesh Vizag Door No.47-14-7/4, Flat.no 202, 1st Floor, Eswar Plaza, Dwaraka Nagar Main Road , Beside State Bank Of India, Visakhapatnam, 530016. Guntur Door No. 5-87-50/1, 1st Floor, Viswasubh Complex, Lakshmipuram Main Road, Opp. Sitaramaiah High School, Guntur, 522007. Tirupathi 20-3-126/B2, 2nd Floor, Sivajyothi Nagar, Tirumala Bypass Road, Near Leela Mahal Circle, Above City Union Bank, Tirupati, 517501. Chandigarh Chandigarh 2nd & 3rd Floor, SCO 68-69, Sector 17B, Chandigarh, 160017. Goa Panjim 4/245/308, Gera’s Imperium Green, 3rd Floor, No.16/116 (31), constructed on the land bearing P.T. sheet No. 73, Chalta No. 13 (Part) at Neugi Nagar, Mala, Rua De Ourem Road, Panjim, Goa, 403001. Gujarat Ahmedabad Unit No. 201, 202, 203, 2nd Floor, Sun Square, Near Klassic Gold Hotel, Off C.G Road, Ahmedabad, 380009. Gandhinagar Shop no. 216-217,219-220 “Pratik Mall”, 2nd floor , Nr.Swaminarayan Dham, Koba, Kudasan, Gandhinagar, 382007. Rajkot 202, Yogi Complex, 2nd floor, Nr. Indira Circle, 150 Ft Ring Road, Rajkot-360001 Surat Shop No. M-38, 39, 40, 2nd Floor, Shreeji Arcade-B Wing, Anand Mahal Road, Adajan, Surat, 395009. Vadodara Unit 305, 3rd floor, Gold Croft, Above Indusind bank, Jetalpur road, Opp. Chiku Wadi, Baroda, Gujarat, 390020. Himachal Pradesh Shimla 3rd Floor, Sarab Complex, A-60, Khasra Nu 70 - 79, Morning sites, Sanjauli, Above Dena Bank Shimla, 171006. Karnataka Bengaluru Unit No. 701, 702 & 703 7th Floor, West Wing, Raheja Towers, 26/27 MG Road, Bengaluru, 560001. “Thunga Complex” 1st & 2nd Floor, #25, 32nd A Cross Road, 7th Block Jayanagar, Beside City College, Opp Bengaluru International Academy, Bengaluru, 560082. Mysuru 2nd Floor, Door No. D1 SF, Shree Ganesh Arcade, 10th Cross, Kalidasa Road, V.V.Puram, Above Green Leaf Restaurant, Mysuru - 570 002. Hubballi Shweta Complex, 1st Floor, Lamington Road, Hubballi, 580020. Mangaluru Essel Towers, 1st Floor, Bunts Hostel Circle (above Axis Bank), Kodialbail, Mangaluru, 575002. Kerala Alappuzha Alleppey Arcade, 2nd Floor, Mullakal Junction, Opposite Shanthi Theatre, Alappuzha, 688011. Kannur 3rd Floor, Grand Plaza, Building No. 33/363, Fort Road, Near Vasan Eye care Hospital, Kannur, 670001. Kochi Thadikaran Centre, 2nd Floor, Palarivattom, Opposite Federal bank palarivattom Kochi, 682025. Kozhikode Bhumidaya Grandeur, 3rd Floor, Door No.1/5030, Nadakkavu Cross Road, Above ICICI bank Kozhikode, Kerala, 673004. Trivandrum 2nd Floor, Kailash Plaza, Pattom, Near Indian Oil Petrol Pump, Thiruvananthapuram, 695004. Madhya Pradesh Bhopal 3rd Floor, 133, Kay Kay Business Center, MP Nagar, Zone 1, Near Manohar Dairy and Above Karvy, Bhopal (M.P. ), 462011. Gwalior Unit No. 3, 3rd Floor,Block - C, No. 8, Alakananda Tower 2, Near Aditya College, City Center, Gwalior, 474001. Indore Unit No. 113, 1st Floor, Bansi Trade Centre, Plot no. 581/5, Mahatma Gandhi Marg, Indore (M.P. ), 452001. Jabalpur Office no 5, 2nd Floor, 46 Ahuja Tower, Napier Town, New Swami Dayanand Ward, Besides Krishna Hotel, Jabalpur, 482001. Maharashtra Mumbai 2nd Floor, Neelyog Square, Office No. 203, Patel Chowk, Near Railway Station Ghatkopar East, Mumbai, 400075. Unit No. 301, 3rd Floor, DLH Park, Opposite MTNL Exchange, S V Road, Goregaon West, Mumbai, 400062. Nagpur 5th Floor, Landmark Building #72 P.N 5 & 6 Wardha Road, Ramdaspeth, Nagpur, 440012. Pune 2rd floor, Office No.10, 11A & 11B, CTS No.1237, Sneh Leela Apartment, Apte Road, Deccan Gymkhana, Near Shruti Mangal Karyalaya, Pune, Maharashtra, 411004. Kolhapur Unit No.13, 14, 15, Jaju Arcade, City Survey No.221, A/2, Near Damini Hotel E ward, gala No.13, Tarabai park, Kolhapur, 416003. Orissa Bhubaneshwar Office No.8 & 9, 1st Floor, Block No.1 & 2, BMC Bhawani Mall, Sahid Nagar, Near INOX Cinema Hall Bhubaneswar, 751001. Punjab Amritsar Unit No. FUF 5-8, “Eminent Mall”, Built on Property bearing No.10, Kennedy Avenue, Mall Road, Near Passport Office Amritsar, 143001. Jalandhar Unit No.T.F-3, 3rd Floor, Eminent Mall Complex Guru Nanak Mission Chowk, Above Passport Office, Jalandhar Punjab 261, Lajpat Nagar, Near Guru Nanak Mission, Chowk, Jalandhar, 144001. Ludhiana 4th Floor, Kunal Towers, No-88, the Mall Road, Opp. Axis Bank Ludhiana, 141001. Tamil Nadu Chennai 2nd Floor, Chellam Towers, No.52/100, L.B. Road, Next to Ganapathy Ram Theatre Above Adidas Showroom Adyar, Chennai, 600020. SB Complex, No.115, W Block, Near Round Thana, Anna Nagar, Above VIP Showroom Opp. Kandaswamy Naidu College near Roundtana Chennai, 600040. Door No.S-4, 2nd floor, Alsa Mall, 147- 149, Montieth Road, opposite to Chennai Museum Egmore, Chennai, Tamil Nadu, 600008. Coimbatore Silver Monnt, No. 170 A, 1st Floor, D.B.Road, R.S.Puram, Opp. to Old Kennedy Theatre, Coimbatore, 641002. Trichy P.L.A.Plaza, 2nd Floor, No.15, Municipal Office Road, Cantonment, Near BSNL Office, Trichy, 620001. West Bengal Kolkata Singhi Regency, 48/1A , Gariahat Road, 1st Floor, Near Gariahat Pantaloons Kolkata, 700019. Kashi Niket, 1st Floor, No.190 C, Satin Sen Sarani, Kankurgachi, Beside VLCC Office Kolkata, 700054. 1st & 2nd Floor, 20A Park Street, Above KFC Park Street Kolkata, 700016. 1st Floor, Krishna Enclave, No.2/1, Bhajan Lal Lohia Lane, Salkia, Near Howrah AC Market Howrah, 711101.